If you are looking for a company with deep experience in infrared grilling, look no further than TEC. TEC literally invented the infrared grill in the 1980's, and continues to be an innovator in this area. The latest TEC grill design, called TEC Advantage, is reflective of this experience. Clean-up is a breeze as well. 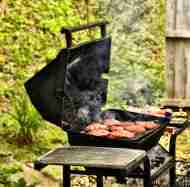 Like most infrared grills, a TEC grill can simply burn off most leftover drippings. The glass radiant panels can be easily cleaned with a spatula. TEC only sells stainless steel grills to begin with, so just about every model cleans very easily. TEC grills are faily well built. Most use 304 grade stainless steel, which while not as corrosion resistant as 316 stainless steel, is still fairly durable. The residential models carry a lifetime warranty on the outer structure and a 5 year warranty on the burners. Traditional TEC grills come in 382. 573, and 764 square inch varieties in freestanding, pedistal mount, and built-in configurations. They also offer some smaller portable models and "budget" models. Propane and natural gas options are available. A TEC grill is an investment, and would definitely be considered a premium brand. Look to spend $3,000 to $6,000 for a traditional free-standing model! For those with more modest means, it is worth noting that TEC has partnered with Char-broil to provide TEC-based burner design in a sub-$1,000 pricepoint. If you are serious about infrared grilling, want a state-of-the-art grill, and have the means, a TEC grill definitely belongs on your short list to consider.